This article shows a preview of some 6 mm Baccus miniatures andGHQ Terrain Maker terrain I am working on.The miniatures will depict Carthaginian and Republican Roman battles duringthe Punic War, using Richard Borg's board gameCommands and Colors Ancients.Other good sites for information on this great game areJohn Foley's CCA site,Board Game Geek's CCA pages,and the Yahoo CCA Vassal group. 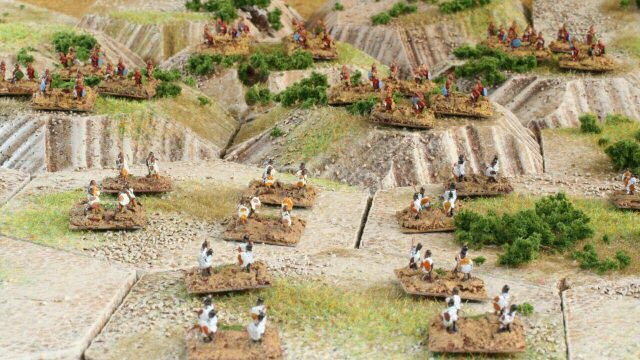 In the photo are 6 mm Carthaginian light infantry (predominantly white) and Balearic slingers(predominantly red) grouped 4 to a 20 mm by 20 mm base.The hexagons are GHQ Terrain Maker hexes which are 4 inches (~10 cm) across painted to looklike the North African desert or the Spanish dry plains.Each hex has some sand, Woodland Scenics grass and foliage glued to it.The plains are 1/2 inch (13 mm) thick tiles and the hills are 1 inch (25 mm) thick. 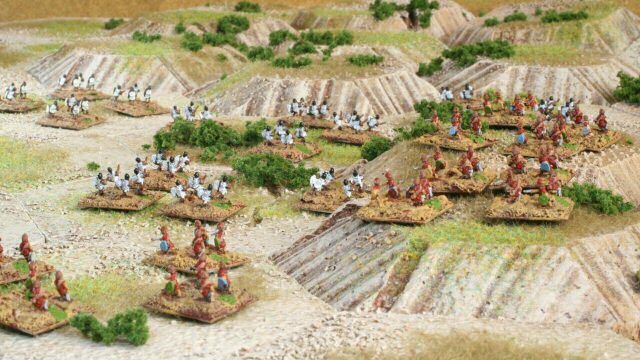 In this photo the light infantry advance for the kill while the slinger rain bullets from behind.The light infantry are Baccus AMO1 Moorish infantry and the slingers are ASP3 Balearic slingers.I also cut some 40 mm by 40 mm flexible magnet sheets so that 4 of the tiny figures could be groupedas a unit.The infantry figures will be based 4, 6, or 8 figures to a 20 mm by 20 mm base.The cavalry figures will be based 2, 3, or 4 figures to a base. 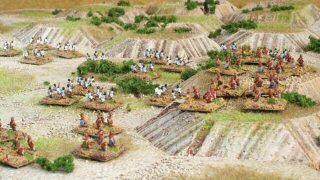 Thanks for visiting and reading about my Commands and Colors Ancients figures.If you have a similar set of CCA figures, I would be interested in seeingyour version and the ideas you used to make the game.More miniatures-related articles are atDan Becker's Miniatures and Models site. Last modified: Thursday, 09-Jun-2011 12:54:00 MST.